What’s in the Box? 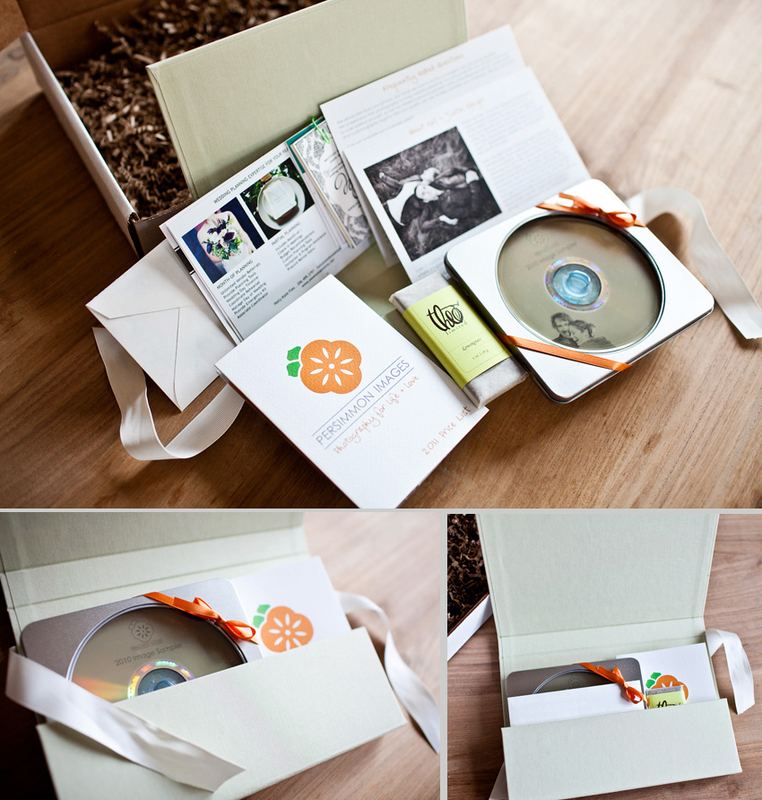 | Persimmon Images Client Packages! I received so much interest in my last packaging post that I’ve been meaning to take some photographs of our client information packets to share for a while now. Well, I finally got around to making one up with time to photograph it before it was put in the mail. Typically, we share these packages with the couples that come to meet us for a consultation at our home. For those who are out of state, we’ll chat a bit by phone email before dropping one in the mail. I looooooove putting these together. They’re so much fun to make! First, the contents: We include a copy of our quad-fold brochure, with prices and information, a postcard full of FAQs, a second post card with our story, a slideshow of images from recent weddings, several cards from our favorite local wedding colleagues, our card, a thank-you note, and a yummy bit of local chocolate. Then, I package it all up like a pretty little gift. Now, because I KNOW you’re going to ask, here’s where I get the goodies! The paper goods (postcards and quad-fold) are from our favorite pro photographic and press lab, ProDPI. Our CDs are LightScribe discs with tin cases from American Digital. We have two types of business cards (not pictured): letterpress cards from Twin Ravens Press and similar square, round-cornered cards from PremiumCards.net. PremiumCards.net is a GREAT place to get biz cards, especially if you want to go a non-traditional but still affordable route. Our TQ notes were purchased in bulk from Smock press (love them!). The chocolate is from Theo Chocolate (obv), which makes delicious, sustainable, organic chocolate right in our neighborhood. The ribbons and box are from Paper Source, which is a packaging-obsessed person’s crack dealer. What’s a real bummer is that the boxes are no longer being made. I bought up a BUNCH on clearance after a saw how beautiful they were on the Fat Orange Cat blog. These boxes are AMAZING and I ADORE them and I am so, so sad that I can’t get any more. They were originally priced about $12 per box, and I got them for less than half that… but I’m down to my last few and I have no idea what I’m going to use after they’re gone. I’d like something similar, and not TOO spendy (up to $15 per) and I’m not averse to having something custom-made. Help a sister out? 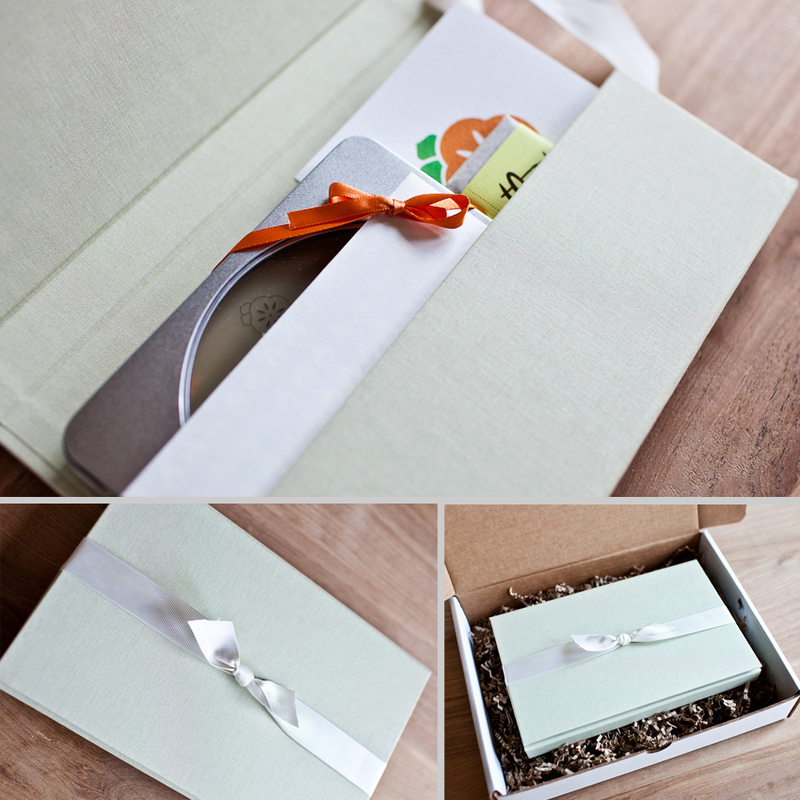 Want to see more custom photography client packaging? Click that there link! Emily - check out http://www.h-bphoto.com they have nice boxes…not at unique as the box you use now…but they do have a color called “Orange Fizz” that might add a “pop” that matches your logo…maybe? Good luck! Wendi - Thanks for all the links. Super helpful. Beautiful package you guys put together. Mariko - Beautiful! Who wouldn’t want to book you as their photographer after getting such a great box of goodies! Kat - OMG SHUT UP! Kat - The boxes were made by Paper Source, but are unfortunately no longer in production. Ashley Daniell Photography - I love love love this! I have been trying to come up with something special to do to welcome clients and this has given me some ideas. Thank you! Question: do you send these to all potential clients whom you’ve talked to? Or only clients who have booked? I only ask because at this point for me, it may be too much to do for all potential clients, but definitely something for booked clients. Nancy Center - Oh my goodness. You are so generous to share this. Thank you so much. May God bless you and your business BIG in the coming year! Nelita - Beautiful!!! Did you ever find out where to order more boxes?